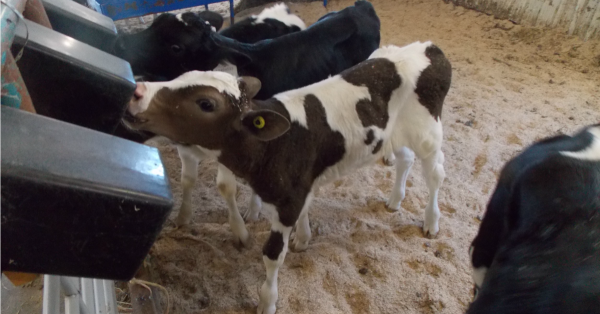 We welcome approximately 70 calves to our farm throughout the year and they are always popular with our guests. Approximately once per year our cows will give birth to a calf. 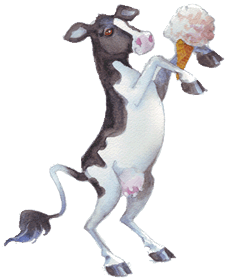 It is in fact necessary for our cows to be pregnant and give birth in order to produce milk. 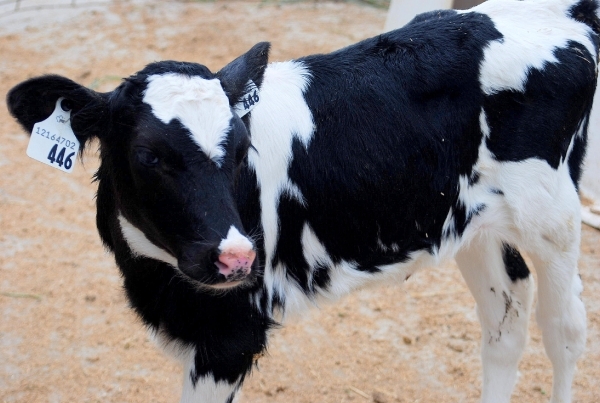 At birth, calves weigh approximately 70 pounds and are standing on their own in about one hour. After being born, calves are moved to a pen within a few hours of being born and before the mother and calf bond. Our experience has been that it is less distressing for the mother and the calf to be separated in this time period. Although the calves and mothers may check in with each other in between the pens, it's very casual and neither call or bawl excessively looking for each other. If we allow the calf and mother to stay together and bond - even for a day - then when they are separated they both are very upset for days. Separating the calves also allows us to manage how much milk the calf receives. Because Holsteins are great milk producers, they will produce too much milk for the calf to digest. If the cow and calf remain together, the calf can be overfed which results in the calf having diarrhea, and the mother has a greater chance of developing mastitis. The first three days of their life, a calf receives the colostrum their mother produces which contains all kinds of great antibodies to give them a healthy start. Our voluntary milking system recognizes the mother when she enters and keeps the colostrum in a separate pail for us to feed her calf. Typically, calves will drink 8 litres of colostrum per day during 2 feedings. Initially, each calf will reside in a white plastic hutch with a fenced in area in front of it. This hutch provides shelter and room for them to move around freely. Having a pen to themselves allows us to monitor their health more closely and minimize the chances of them picking up a bacterial infection. The hutches themselves are lightweight, easy to clean and let quite a bit of light in. After about 3 days, the calves then move to a group pen with other calves of similar age. We're trying something new. Read about Our Cuddle Pen. 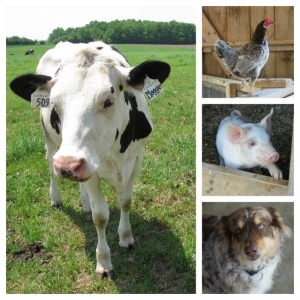 We also offer small amounts of grain and hay for them to eat, although milk remains their primary source of nutrients. During this time, their rumen is developing and getting used to digesting roughage. At 4 months, the calves are now ready to be weaned from milk. The rumen of the calves has now developed and they are able to digest roughage such as hay, as well as grains. To reduce their reliance on milk the calves are only given one feeding of milk per day, which increases their appetite for hay and grains. Female calves are almost always raised to maturity at our farm. Once mature at 16 months, they will weigh approximately 1,200 pounds. They either become a member of our herd or are sold to become part of another farmers' herd. After reading the information, if you have additional questions or comments please feel free to drop us a line at info@mapletonsorganic.ca.